After the fuel price hiking in the all around the world , there is the big race start’s between the all automobile companies that who could be made the most fuel efficient car. This time Toyota has definitely won the race. TOKYO (Kyodo) - Toyota Motor Corp. on Monday began selling in Japan the Aqua compact hybrid vehicle, which it claims has the world's best fuel economy. The vehicle is equipped with a new 1.5-liter hybrid system and gets 35.4 kilometers per liter under a new testing method close to actual driving conditions, Toyota said. The automaker has reduced the weight of the hybrid system by more than 40 kilograms compared to its Prius system, it said. Priced from 1.69 million yen, Toyota said it aims to sell 12,000 of the vehicles per month within Japan, and eventually to begin selling it in approximately 50 other countries including the United States. The Aqua is made at Toyota subsidiary Kanto Auto Works Ltd.'s plant in Iwate Prefecture, one of the areas hit hardest by March's devastating earthquake and tsunami. Kanto Auto Works President Tetsuo Hattori told a release event in Tokyo that he hopes the Aqua will become a "small light" in the recovery from the March 11 disaster. "We want to raise (the brand of) the new vehicle successfully and we ourselves want to grow" through the process, Hattori said from the Iwate plant, in a live video feed to the launch ceremony in Tokyo. 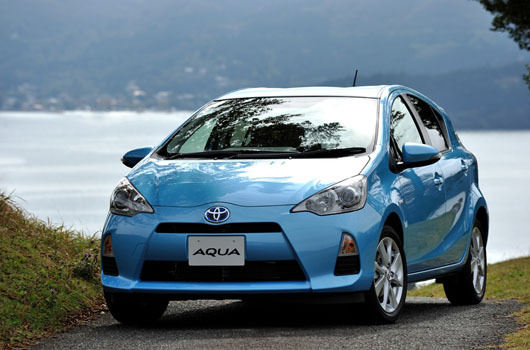 As part of its effort to promote the Aqua, Toyota will launch "Aqua Social Fes! !," a series of activities which invites people to clean up and preserve waterfront environments in 50 places across Japan.